At CGTV, one of our greatest thrills it to see former students live out their acting passions. With that thought in mind, we are excited to announce that CGTV graduate, Jackson Robert Scott, is part of the cast of the September 8th release of It. Jackson started his acting career at the young age of five when he began the CGTV program. 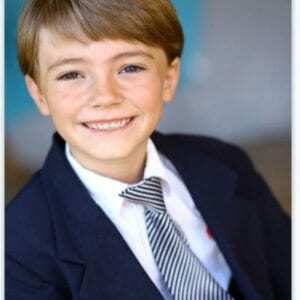 His training allowed him to work with other successful child actors from the likes of Nickelodeon and Disney. He also got personal training from Adrian, the founder of CGTV. After his training at CGTV, Jackson was discovered by a top LA agency where he began auditioning for a variety of commercial, television and film projects. His breakout credits include television commercials for K Jewelers as an episode of Criminals Minds. In his role on the fourth episode of Criminal Minds, season 11, Jackson played Cole Vasquez who is kidnapped by the episode’s anti-hero, William Duke Mason. The show first aired on October 21, 2015. In addition to his small screen successes, he has also made his way to the silver screen in the remake adaptation of Stephen King’s: It. In the “creepy clown” horror movie, Jackson plays Georgie who is the younger brother of the film’s main character, Bill. The show will make its theater debut on Friday, September 8, 2017. If the trailer views of this thriller are any indication, it should be a box office hit. According to Variety, the It trailer set a record for most online views in a single day, with 197 million views in just 24 hours and 246 views 36 hours after its release. This is our goal at CGTV – to help young talent get discovered and reach their full potential. We offer a demanding and robust curriculum that is designed to do just that. CGTV has connections with top agents, casting directors and managers. We offer our students workshops in improvisation, techniques for the perfect audition, marketing tools and other information to help them get a foot in the door. In addition, our students learn from the very best in the business, including actors from top network stations. For more information on how to enroll in CGTV, call us at 818-284-6689.